That’s one of my mottos when it comes to adding serious drama to almost any room. And it never fails to deliver. 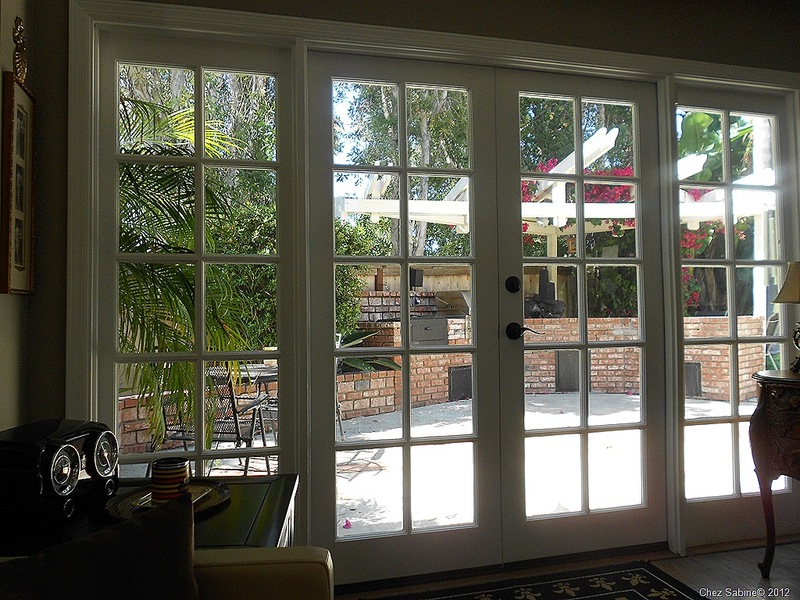 So, when I find that a big box store like Home Depot or Lowe’s offers a terrific sale on French doors, I’m checking it out. Remember, I’m all about a bargain. 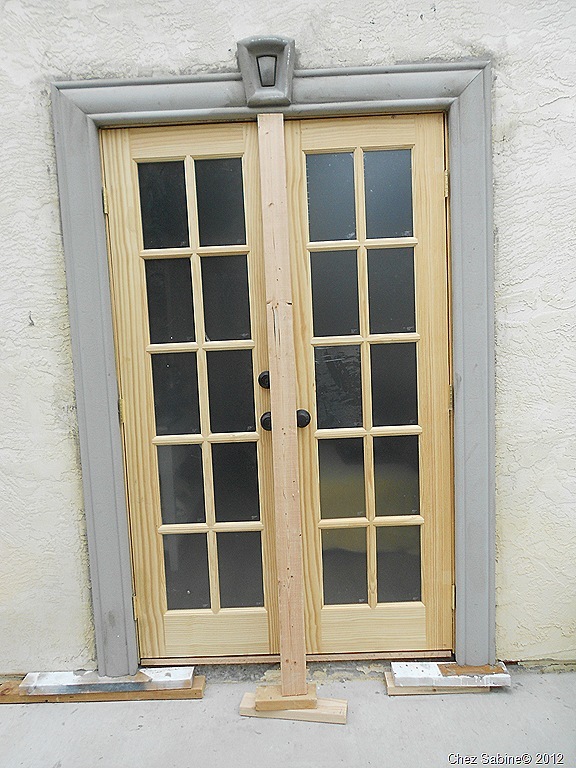 And, in this case, I found a set of solid wood French doors with true divided light window panes for way under $200. Now, that’s a deal I couldn’t even consider passing up. 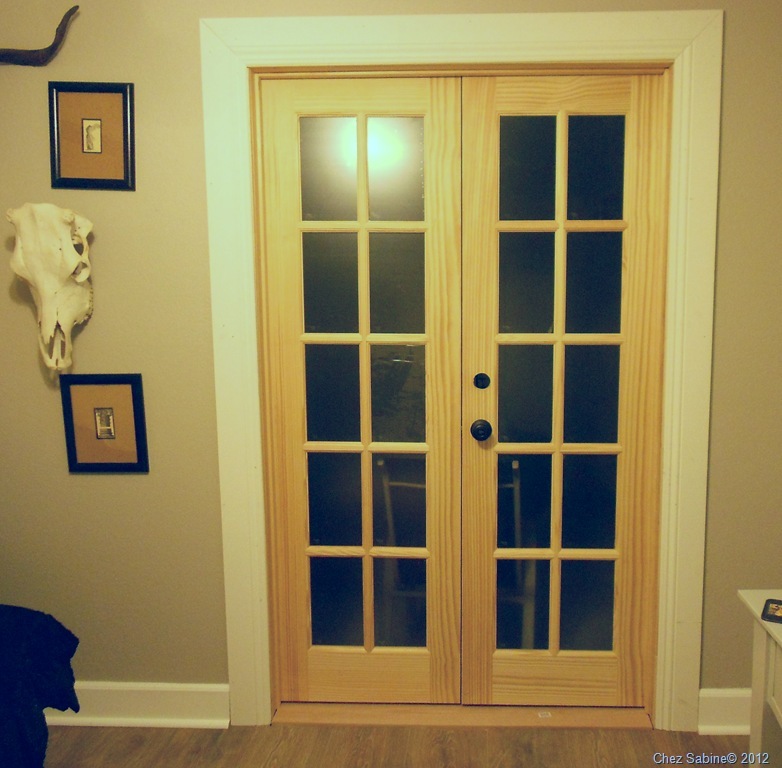 I have to tell you that these doors are interior doors but, where I live, the temperature doesn’t crawl much above 70 degrees or slink below 60, give or take a few. So, there are no worries about the door not handling the climate. 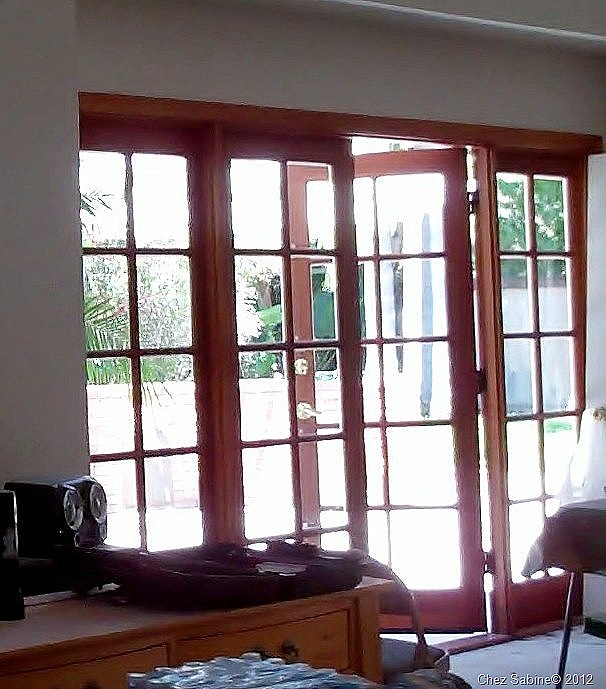 In fact, when the house was built in the mid-80, long before I bought it last year, the builder installed a huge set of interior French doors in the dining room (now the living room) that goes out to a side patio area, and those doors are still in excellent condition. And after a good cleaning and several coats of an oil-based primer and white exterior latex paint, they’re now the focal point of the room. 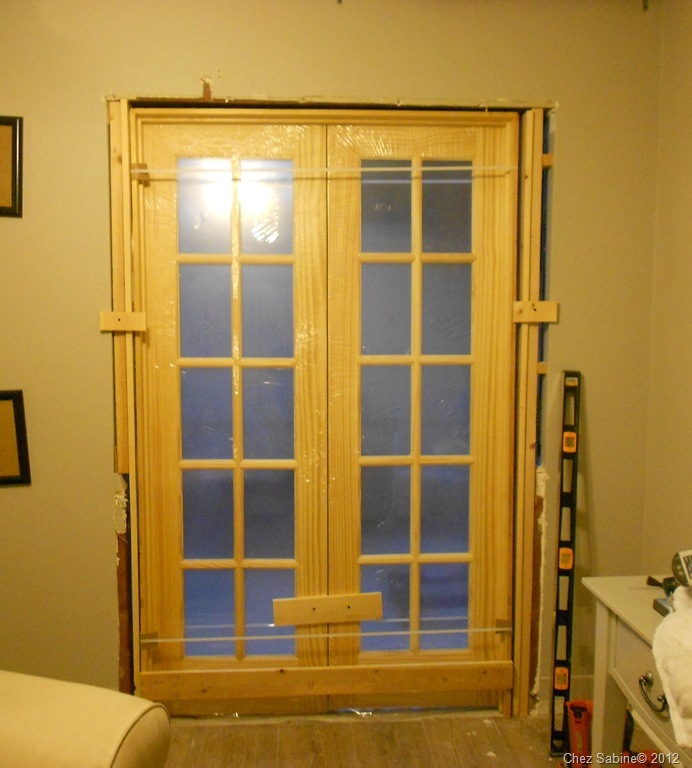 The original French doors during the renovation process last year. The doors received a good scrubbing, some primer and paint, and now they’re ready to last for decades to come. The current room that was in desperate need of a French door was a small bedroom that’s being used as a little TV den. It faces a concrete side area that gets a ton of afternoon sun and is fairly close to the neighbor’s side yard. 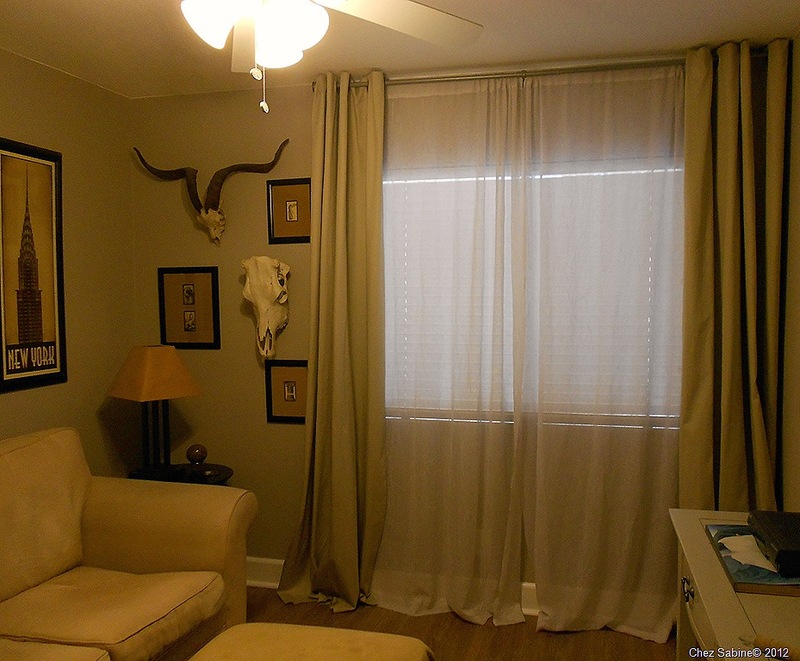 It was a long, drab, narrow space that begged for some attention. It’s getting plenty now. 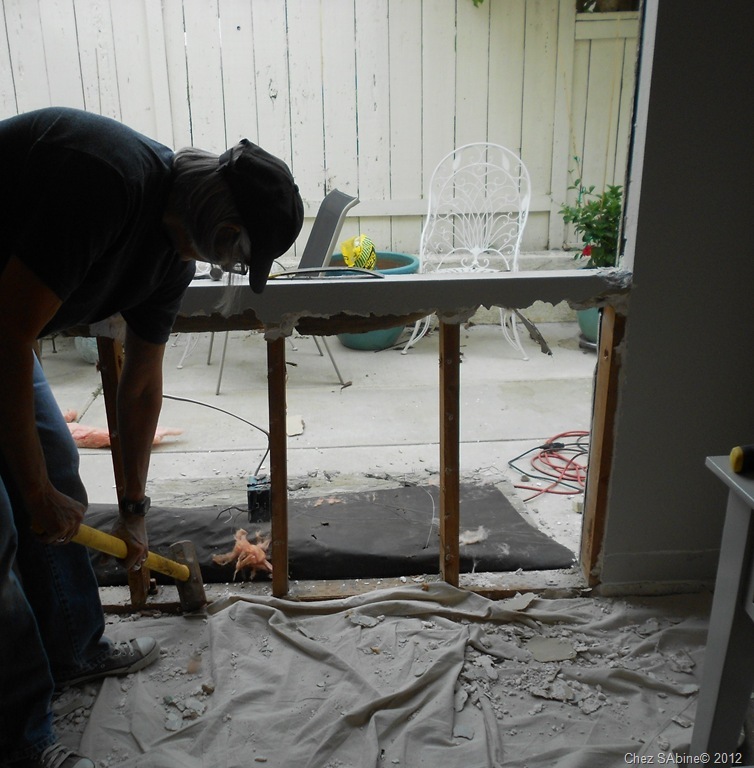 I want you to see that removing a window, knocking out a wall and installing a French door is not an impossible feat – and the payoff is dramatic and practical. 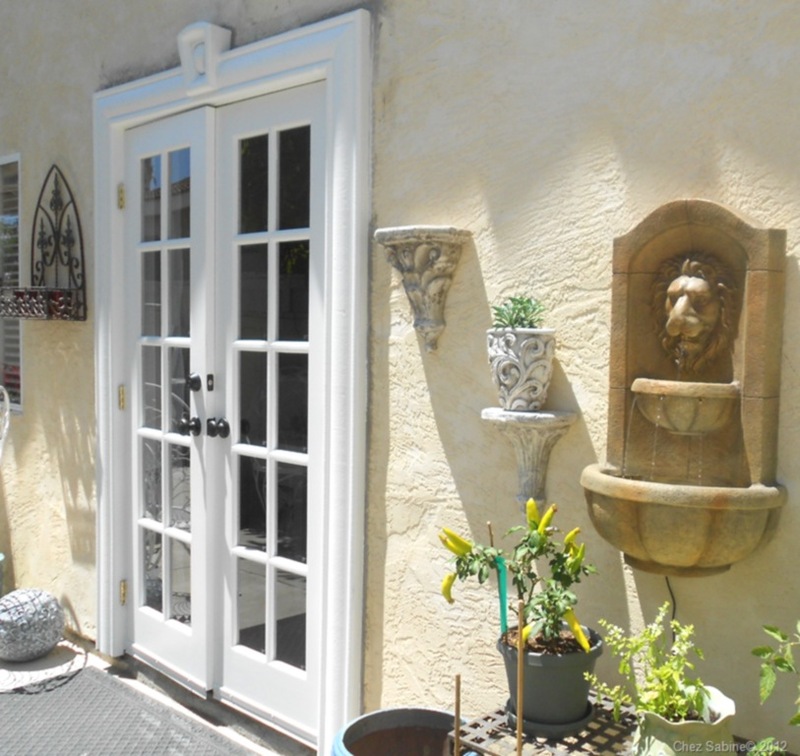 It not only opens up the house, even though the room is at the end of a hall, but the doors are now almost always open, and the breeze that flows through all of the rooms is amazing and a welcome visitor since there’s no air conditioning. And, sure, I’ll give you a peek of the transformation of the side yard, but it’s still a work in progress, so I’ll save much of that for a later post. But I will say that even in its unfinished state, this little area and the den have now become everyone’s favorite getaway spot. 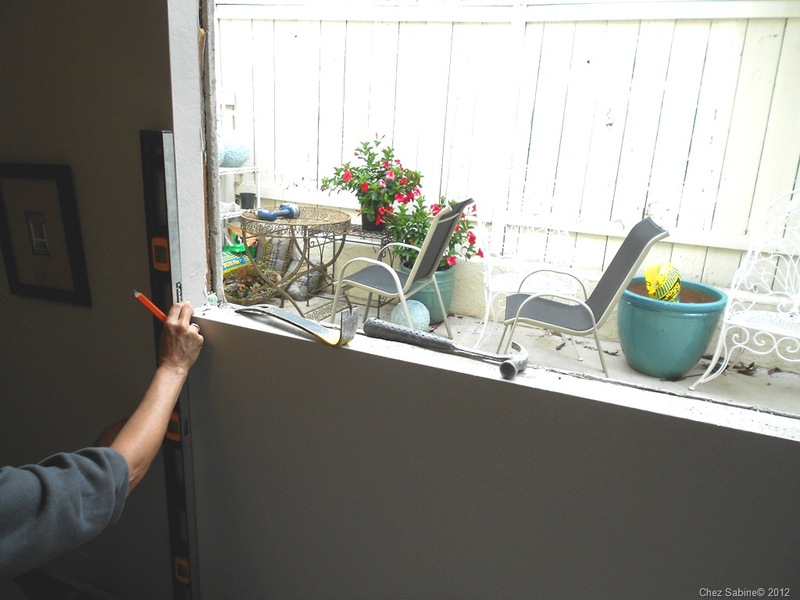 Here are some tips and ideas if you’re going to install a French door. The problem with turning a small bedroom into a den is that, more often than not, it tends to still look like a bedroom without a bed. And that window didn’t exactly scream media room. Gee, what a sunny snore fest. 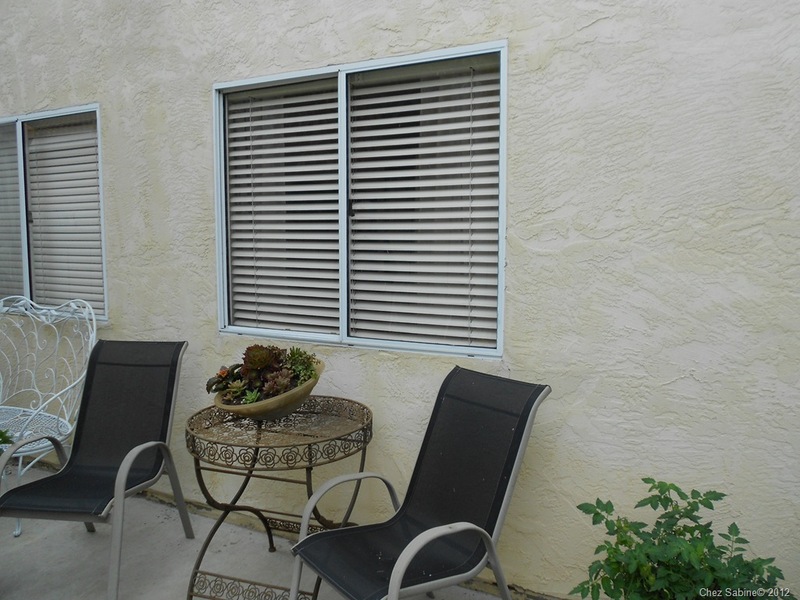 The window on the left belongs to the guest room and the one on the right is the den’s. 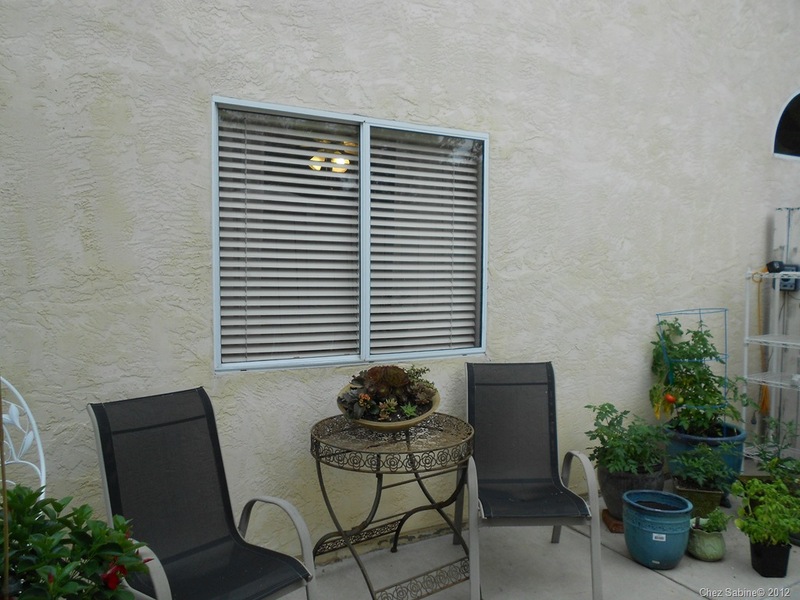 This side area was barren when it came to style, charm or personality. 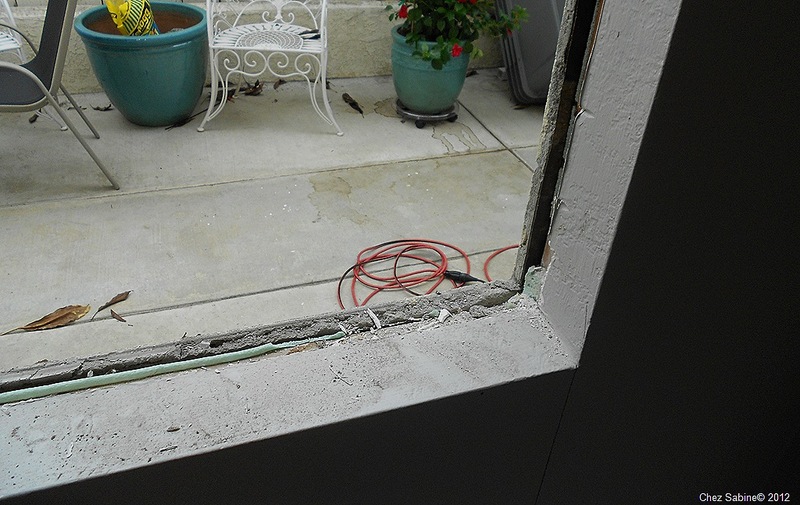 The window had to be removed, then the bottom half of the wall had to come out. 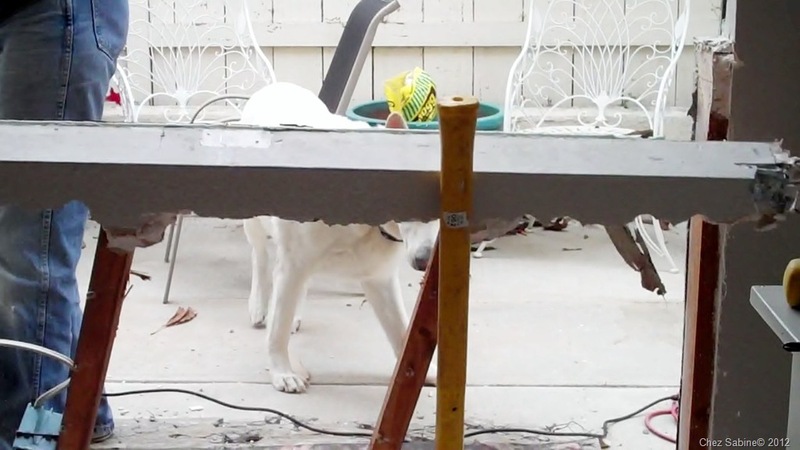 And you’ll see that you can do this without having to slam a sledge hammer into the wall. 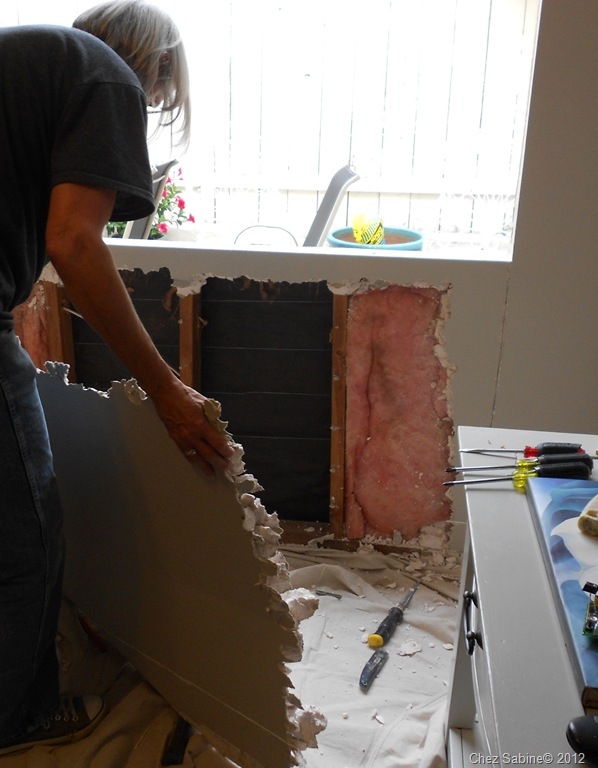 Unlike what you see on television, a demo project doesn’t mean that testosterone has to run amok when walls come down. This wall had an electrical outlet, which was going to go away because there are two others in the room. 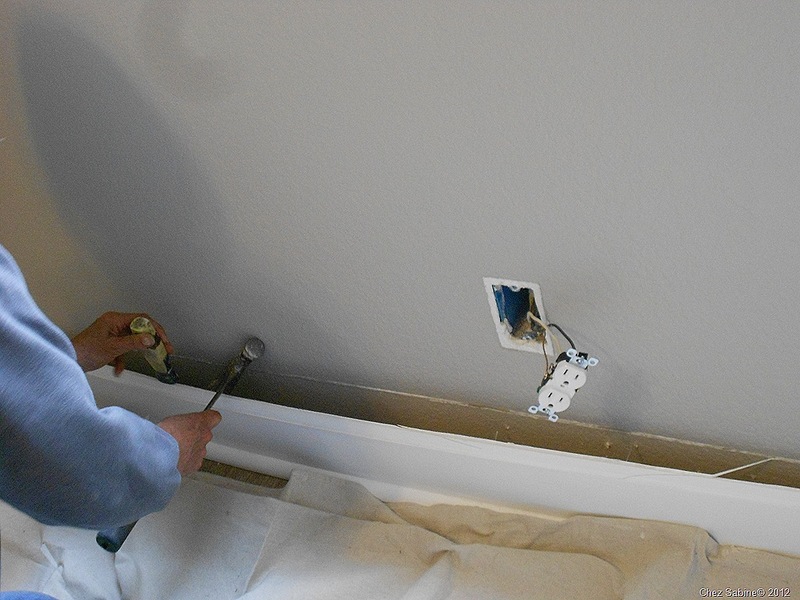 If you’re removing a wall with an outlet, then make sure you turn off the power at the circuit panel before you start. This is fairly new base molding, so saving it was essential since it was going to be placed back on either side of the French door. 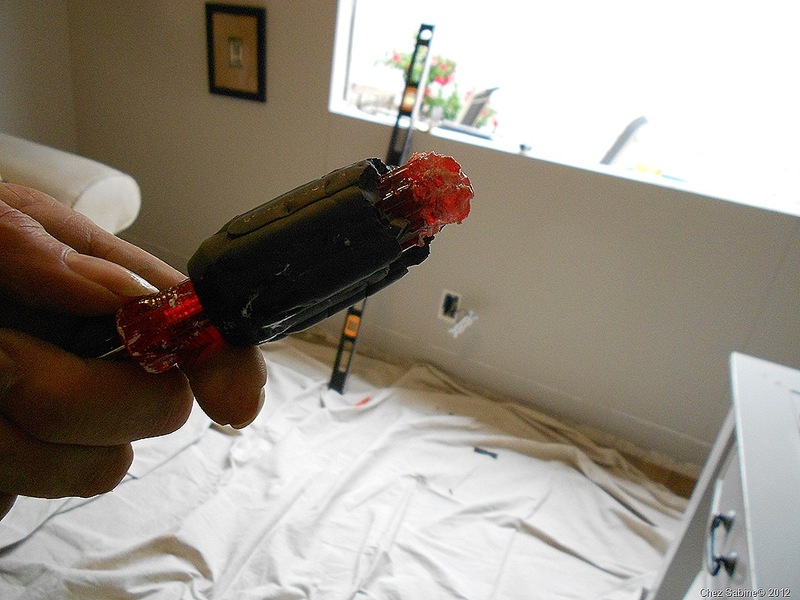 To remove it without damage, use a sharp mat knife and carefully run the blade between the wall and molding. This breaks the silicone seal. 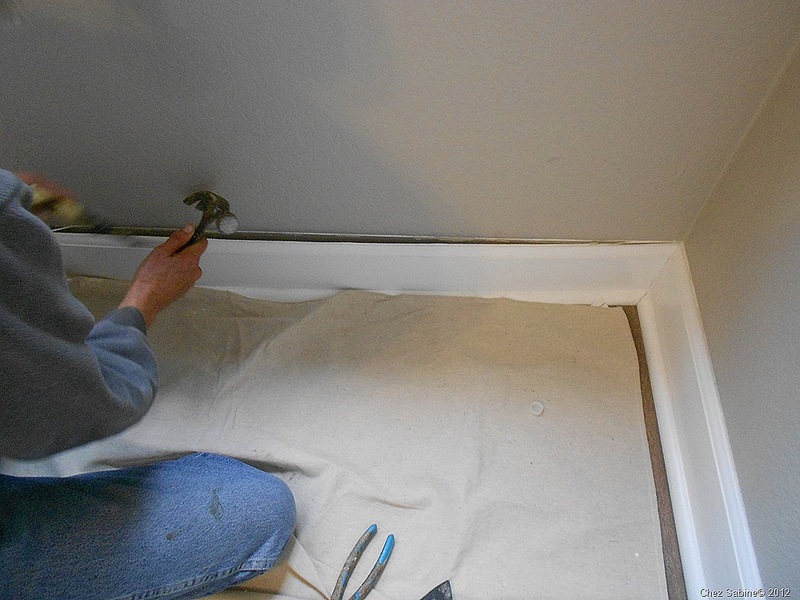 Using a claw hammer and a small painter’s scraper or 5-in-1 tool, gently pry the molding away from the wall, making sure you get it in one piece. It’s easier to do than you think. Just be patient. See how easy that was? 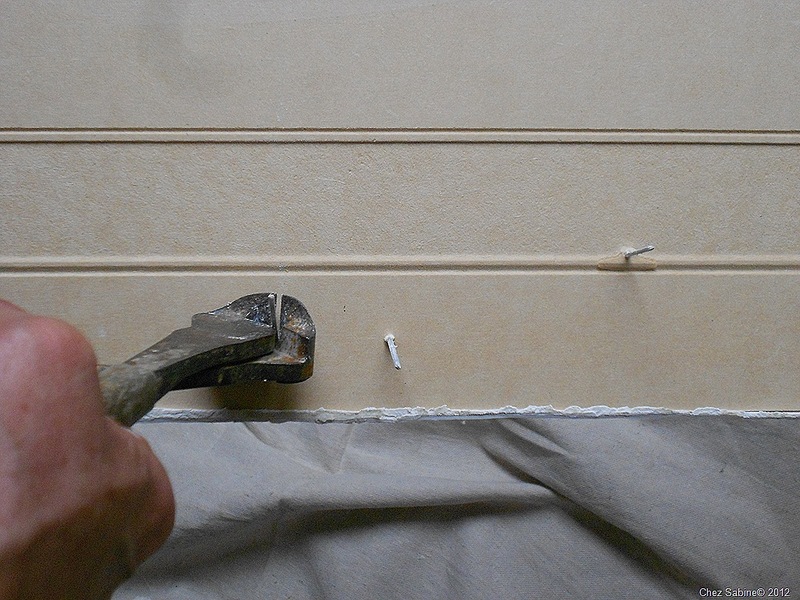 Now, it’s important to remove all of the nails from the molding. Using nail nippers, remove all of the nails and discard them. 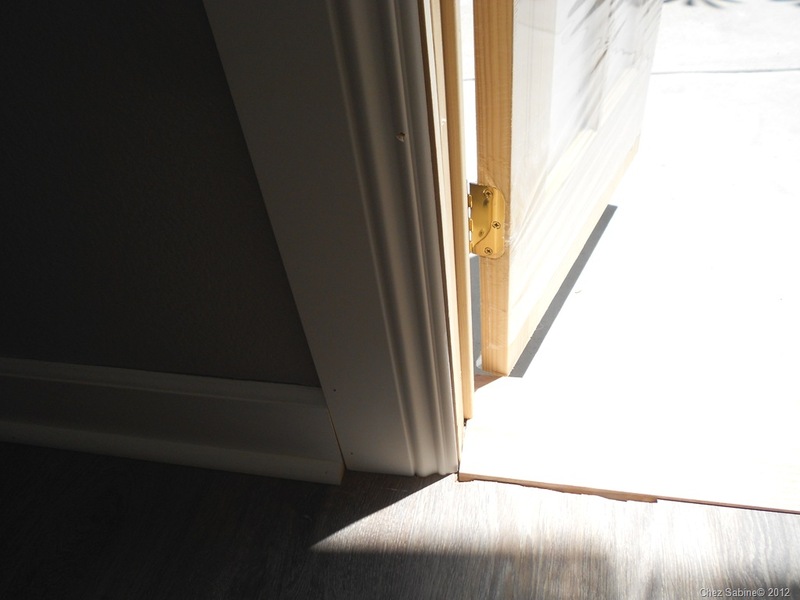 You’ll be using new ones when you cut the molding and replace it after the door is installed. 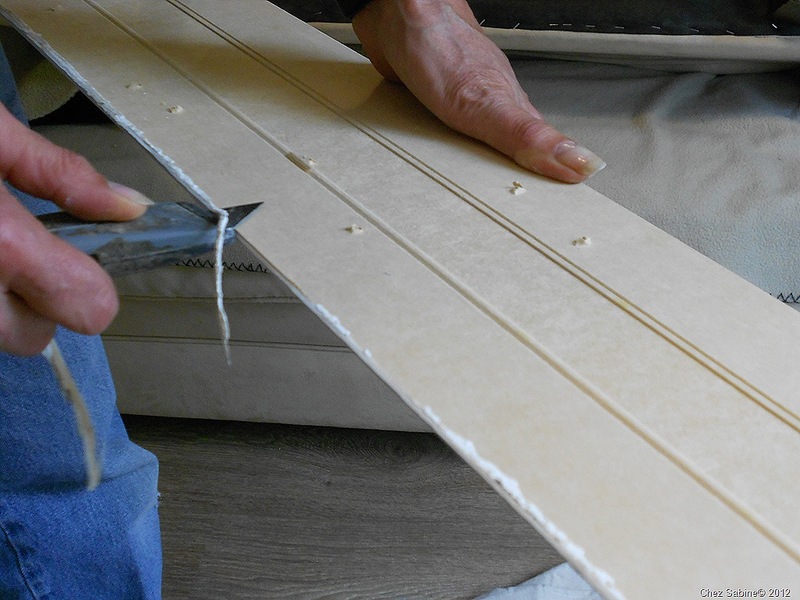 Once the nails are removed, grab that mat knife again and carefully remove any remaining caulk from the top of the molding so that it’s clean and smooth. That way, it’ll rest flat against the wall. 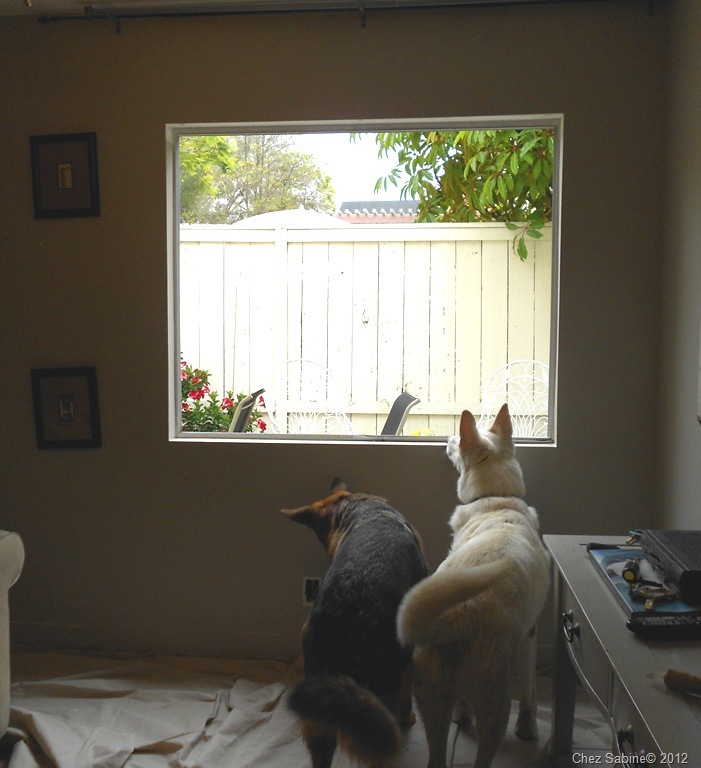 Dexter and Luke are very curious about the missing window. OK, Dexter’s more focused on the dangling outlet. Good thing the power was turned off. 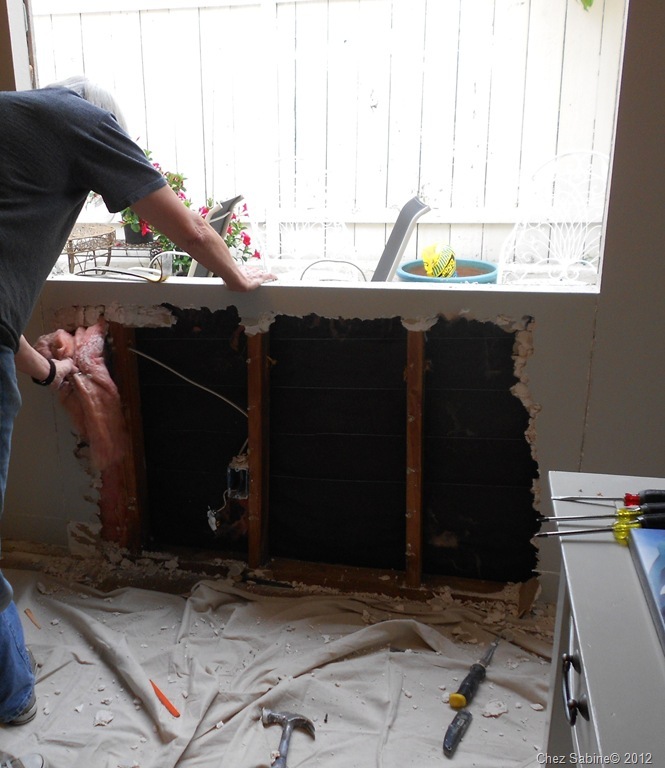 Once the window and frame are removed, it’s time to prepare to take down the wall. 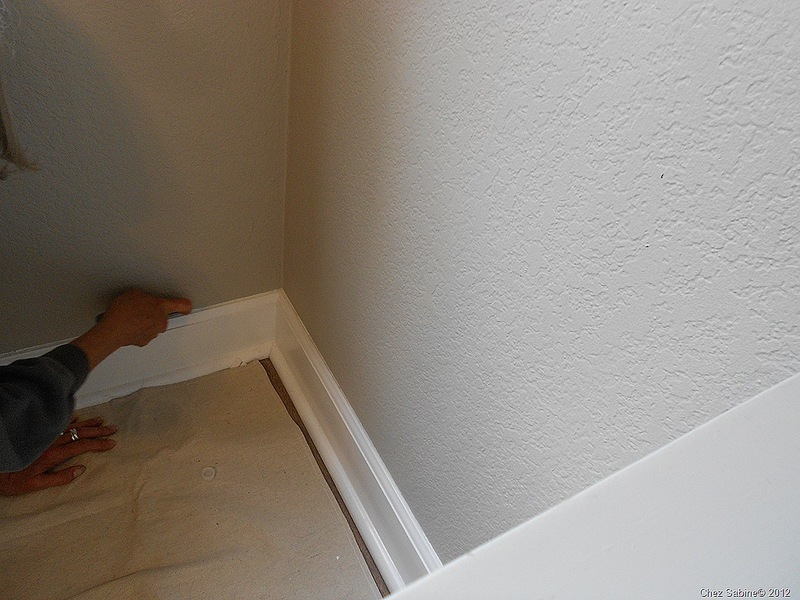 Using a level, draw a straight line on the wall that follows the opening of the window down to the floor. Do this on both sides. 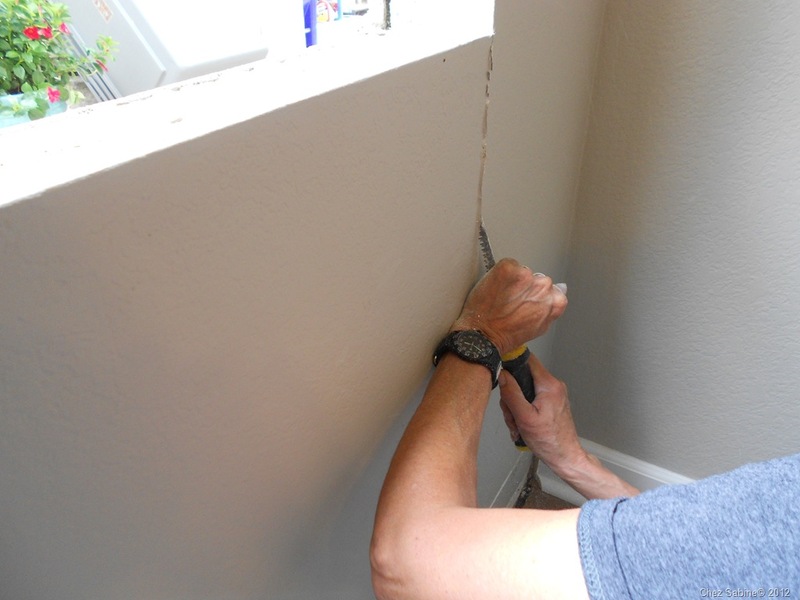 Score the pencil line with a hand-held drywall saw instead of an electrical saw. 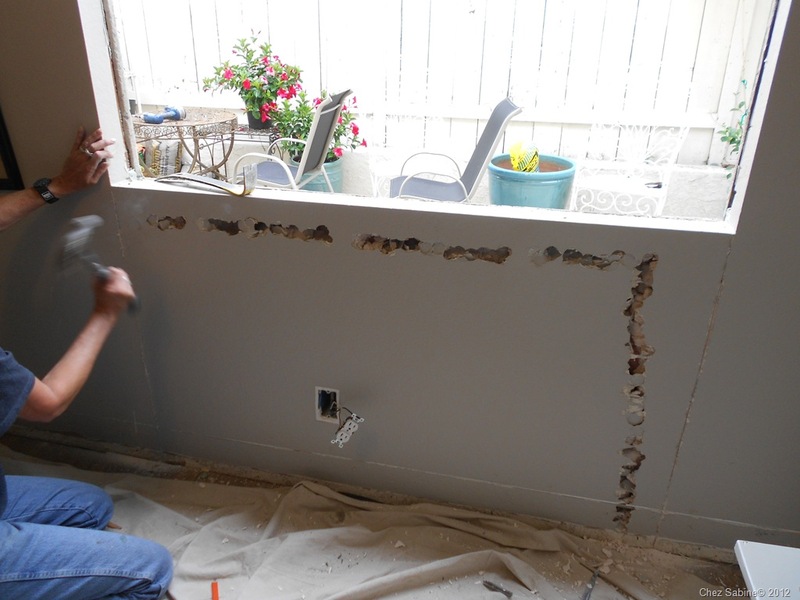 That way, you won’t have to worry about cutting into any electrical wiring because, at this point, you don’t know what’s behind the wall. 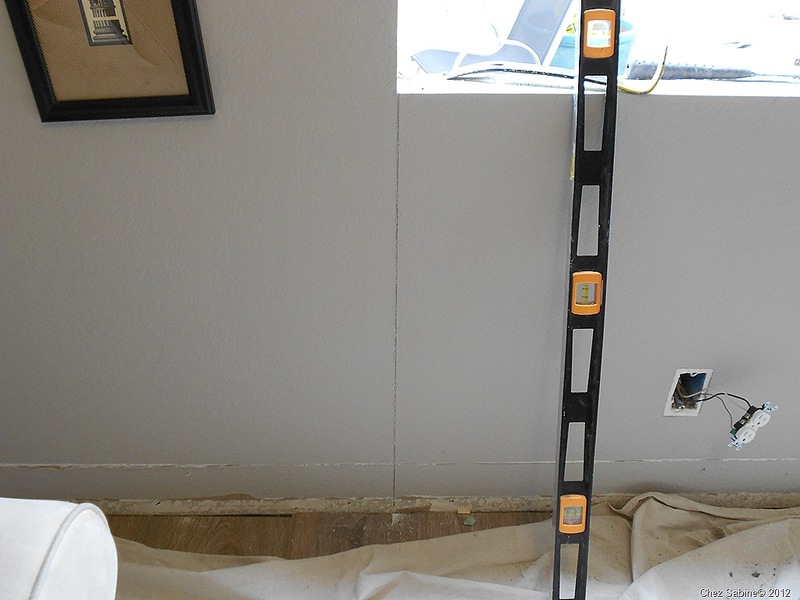 Using a hammer and a moderate amount of power, you simply tap, tap, tap your way around the drywall. 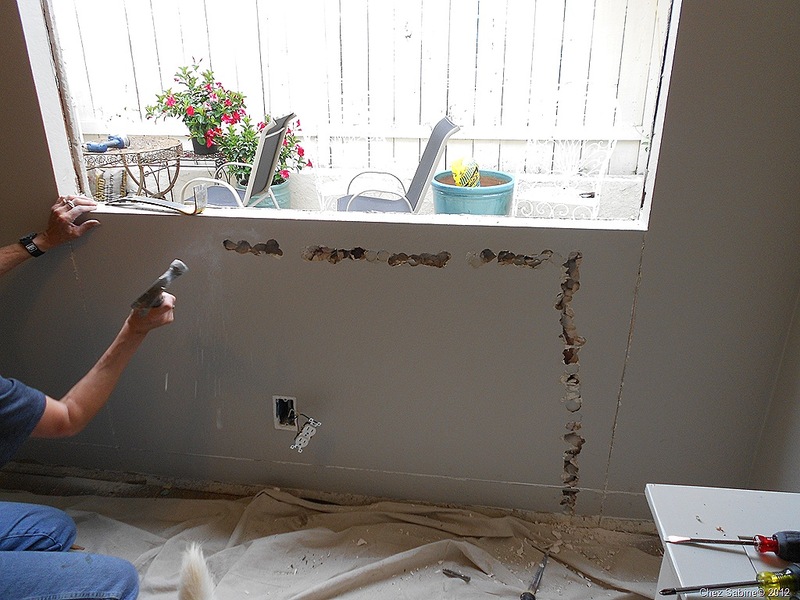 Once you’ve perforated the drywall, you can pull it from the wall fairly easily. Yay! 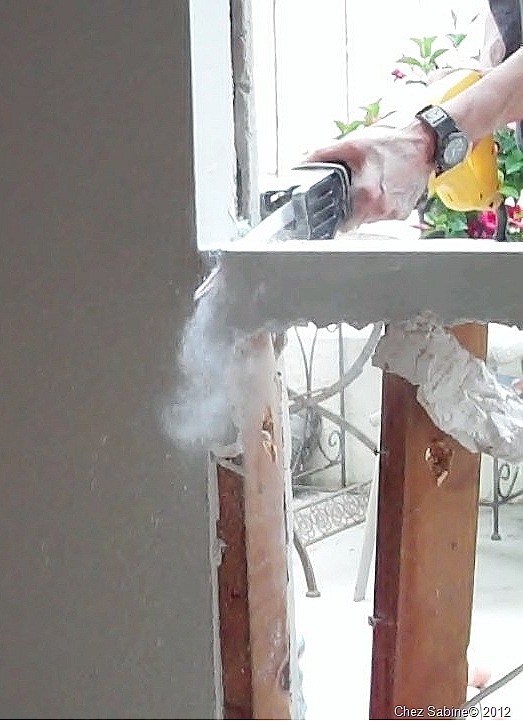 No surprises behind the drywall. Listen, do enough of these projects and you’ll find you can’t always say that. 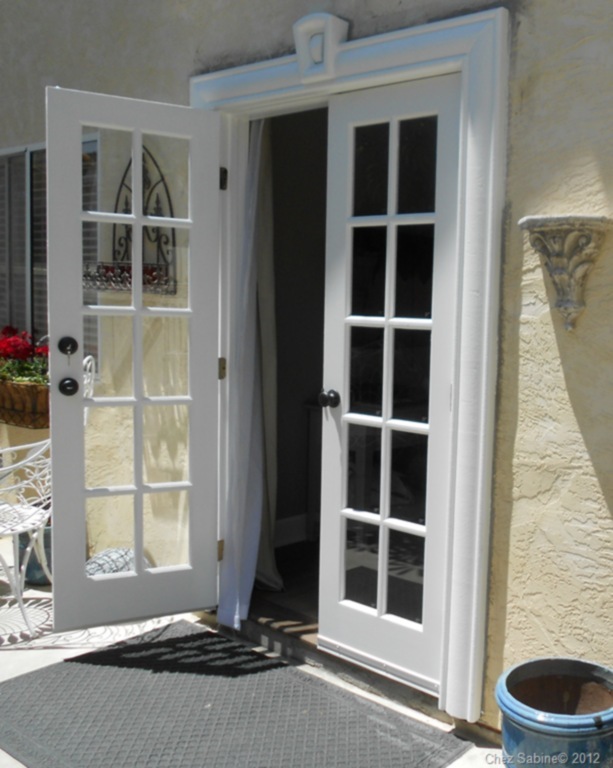 The exterior of this house is stucco, and the last French door project that was almost identical to this one, was done on a house in Atlanta with a brick exterior. This was much easier. 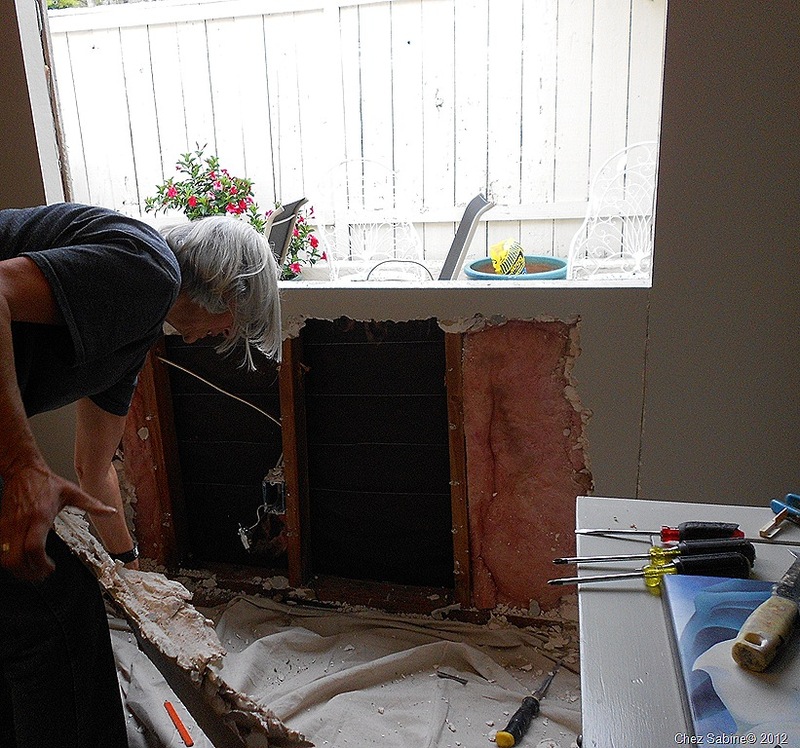 So, now it’s time to pull out the insulation (wear a mask, gloves and safety goggles) and cut out the stucco from the outside. 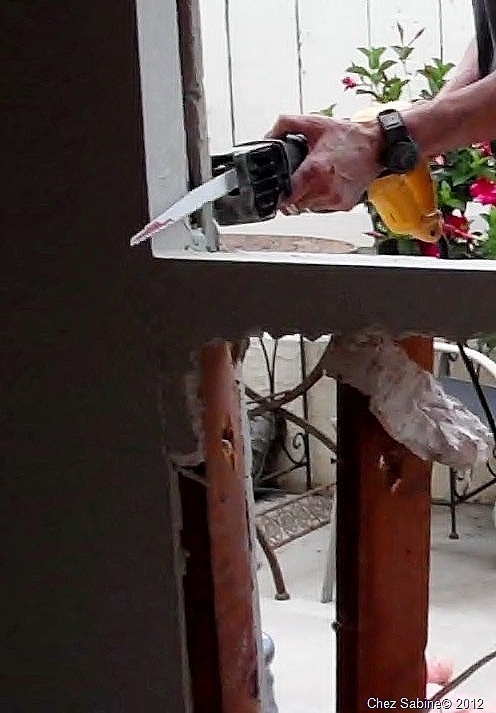 Once that’s done, a reciprocating saw helps to remove the remaining framing. There goes the wall. Luke is checking it out. 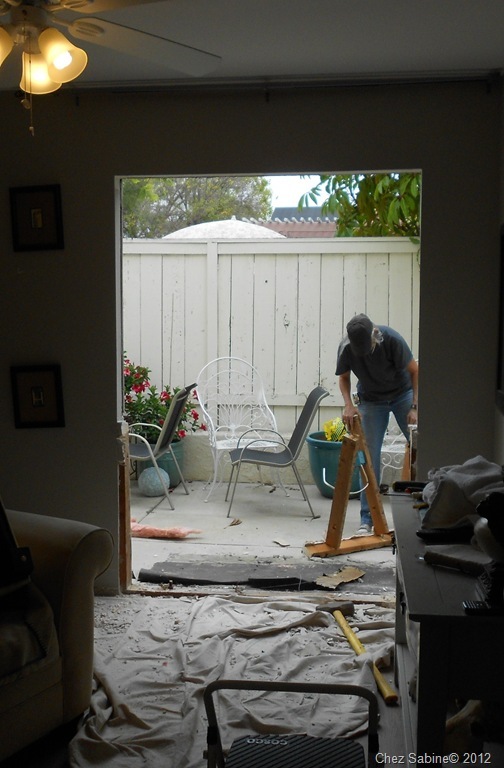 It’s time to clean up the area and get ready to frame the new opening for the French door. The look is already dramatically different. 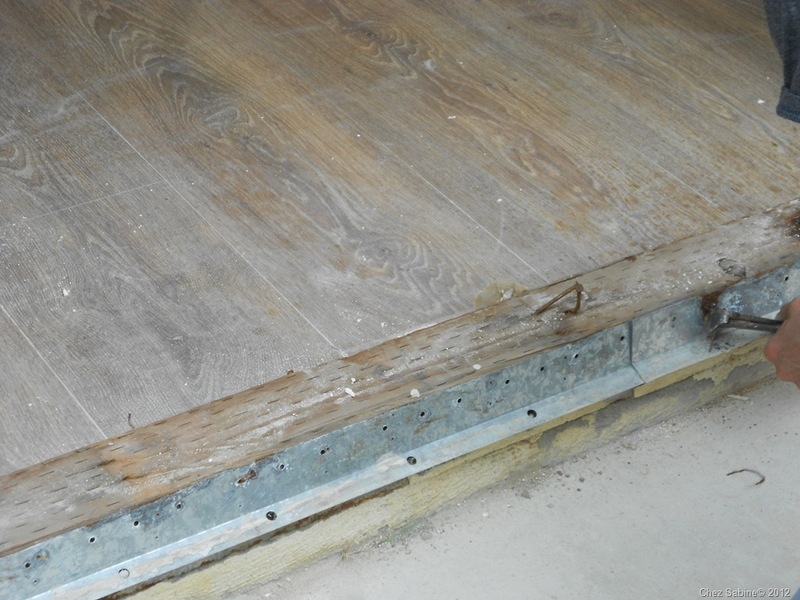 Remove nails and any scraps on and around the threshold. OK, does this look fantastic or what? And the door’s not even installed yet. 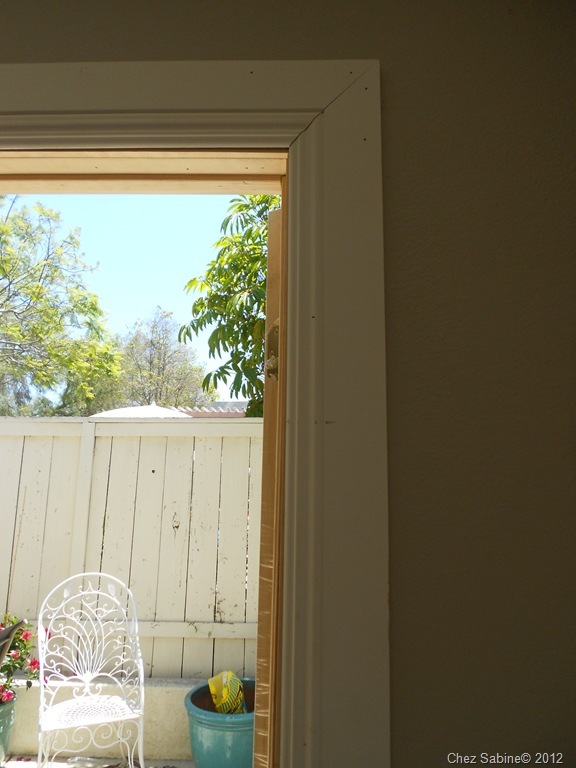 Because the French doors aren’t quite as wide as the the opening, a little extra framing is needed. The doors were literally slipped into the space. This was done in one afternoon, and it was now getting dark, so I’ll show you how the doors were kept in place for the night. You’ll notice three of these pieces of wood – two on the side and one larger one on the bottom. They’re keeping the doors from falling in since they’re not secured at this point. They were placed on the exterior as well. 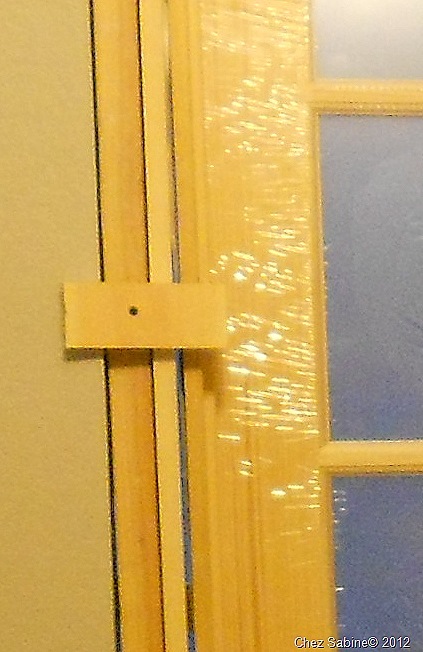 The next morning, the hinges were attached and the trim was installed. 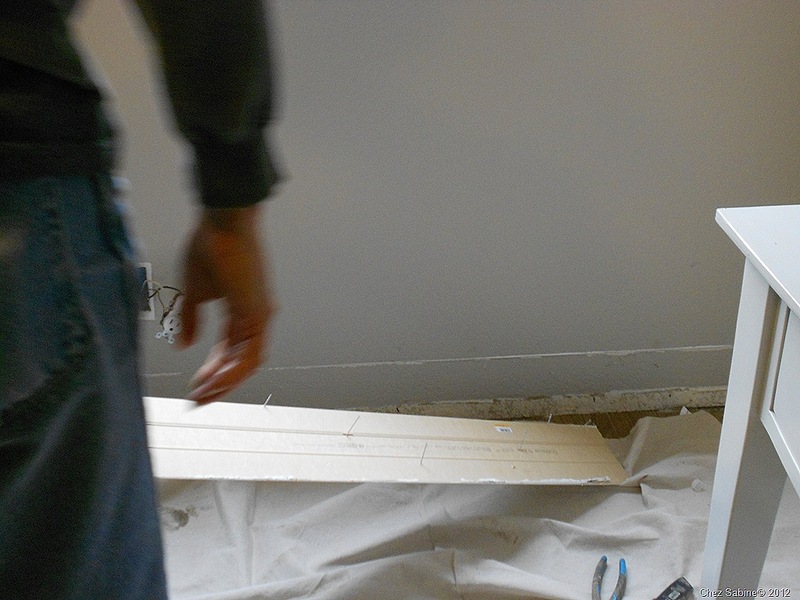 A threshold was put down, and the base molding nailed back into place. The door hasn’t been primed and painted at this point, but the hardware is installed. Note that when you’re putting a dead bolt on a door that’s surrounded by glass, you need to install a lock that uses a key to lock, not a knob. And don’t keep the key in the lock at night or when you’re away. Do keep it nearby in case you need it in an emergency. 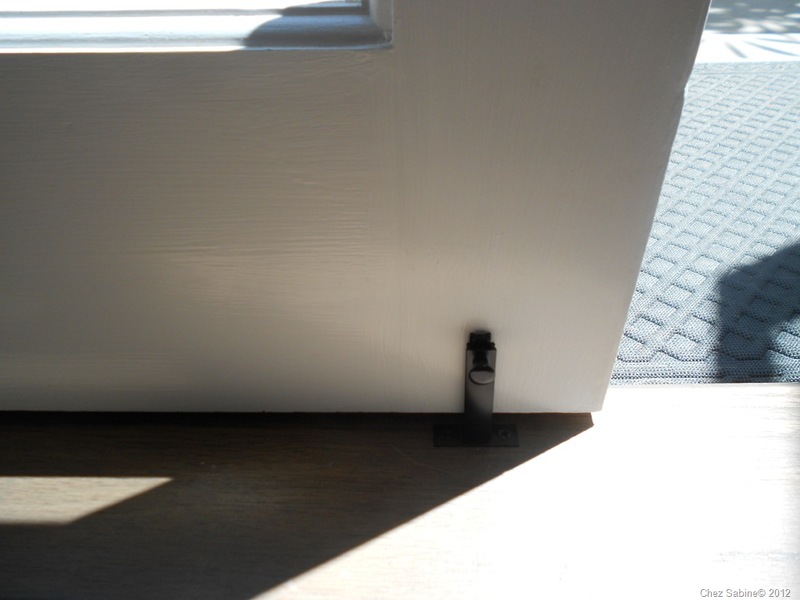 Slide-rod locks were installed at the bottom and top of one of the doors. I decided a keystone would add a decorative touch to the frame. But it needed a bit of propping up for a day just to make sure it remained level as the adhesive dried. 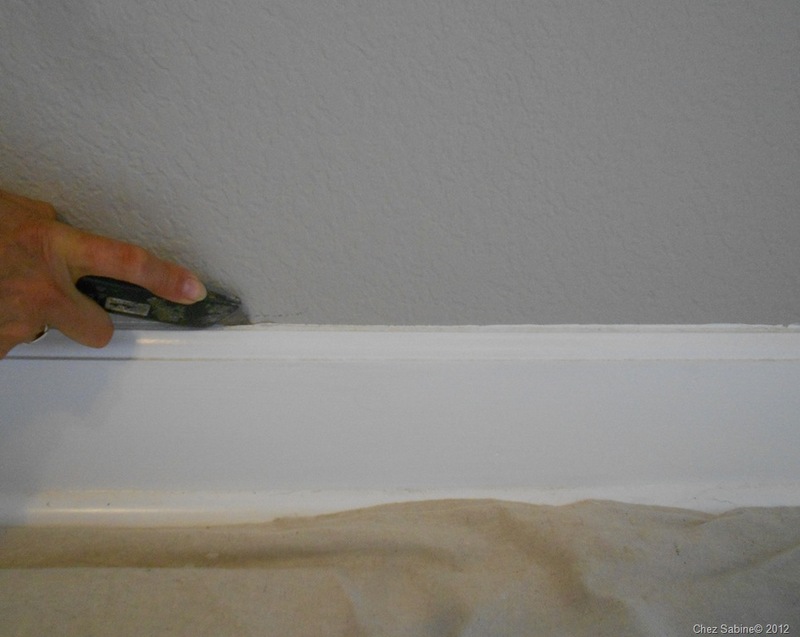 It looks as if there’s gray paint around the trim but that’s a cement-like adhesive that was sold next to the trim. Unfortunately, I didn’t know then that the company recommends a clear silicone adhesive. Use the clear. 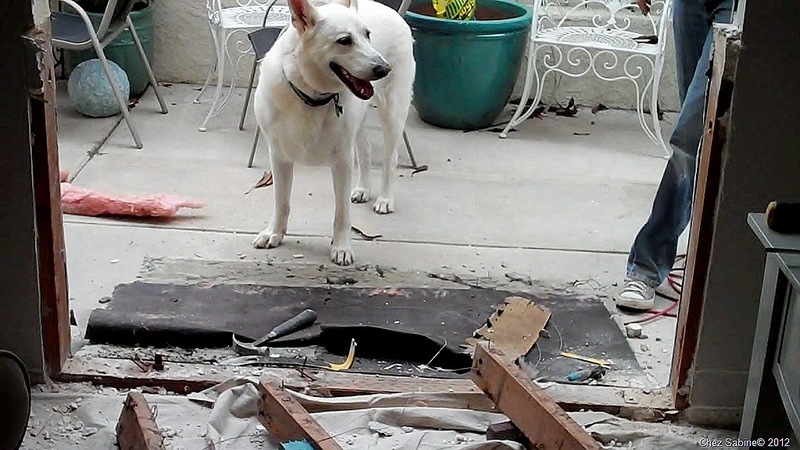 It’s not a big deal because the house is going to be painted soon. Remember what that window used to look like? 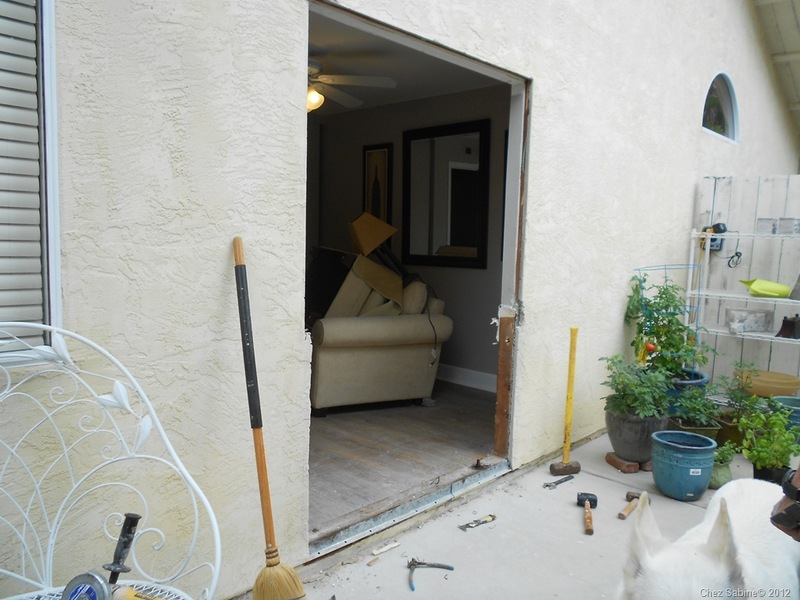 It’s now a fabulous French door with a terrific side yard area that’s getting a lot of use. 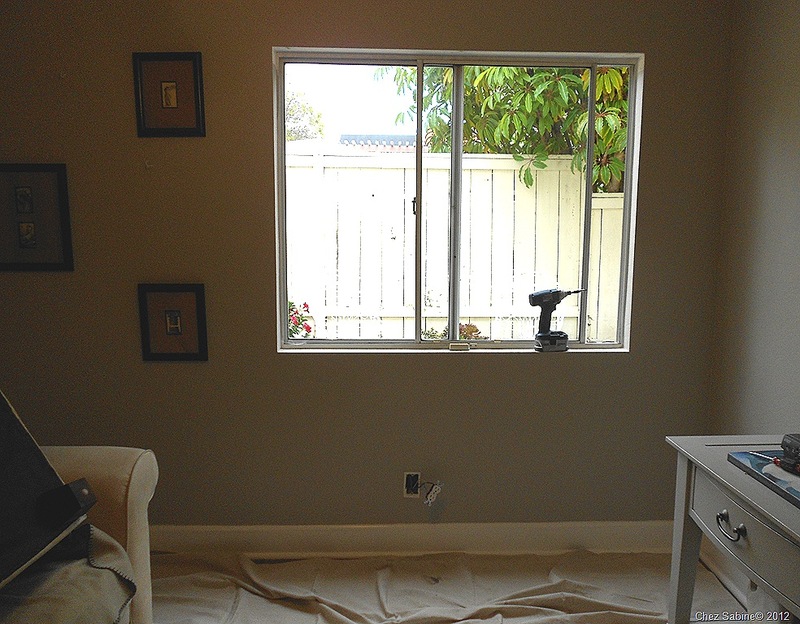 This area is still a work in progress and I’ll show you the finished product when the transformation is complete. 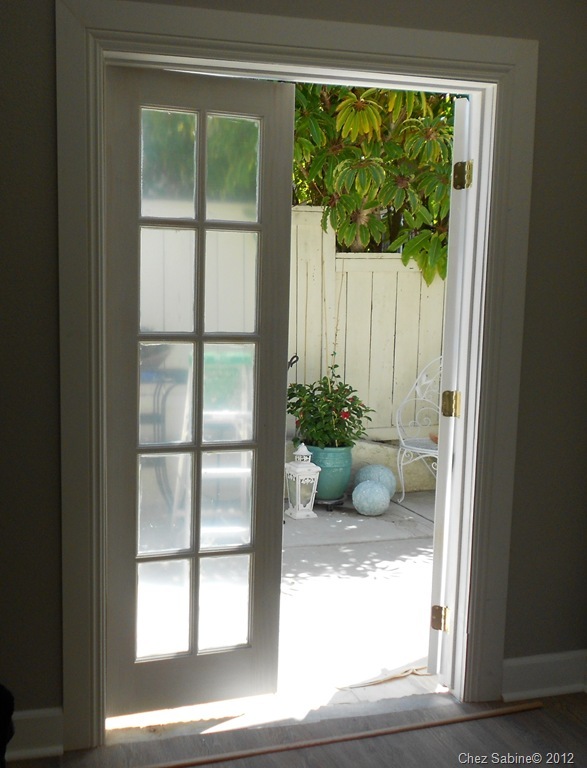 Now, look around your house, there must be a window that needs a French door makeover. If so, I’d love to see it. And for more details, check out the video. We saw the before and after in person and the transformation is amazing! Great job! Thank you, Laura. I’m so happy that you enjoyed it. The efforts were well worth the results. What steps do you take if you have brick siding? Thanks! I am doing this right now! :) Great tutorial! Share those photos. I think you’ll love the results. Thanks! Window turn to door ! Can you give me an idea of cost for a project like this? 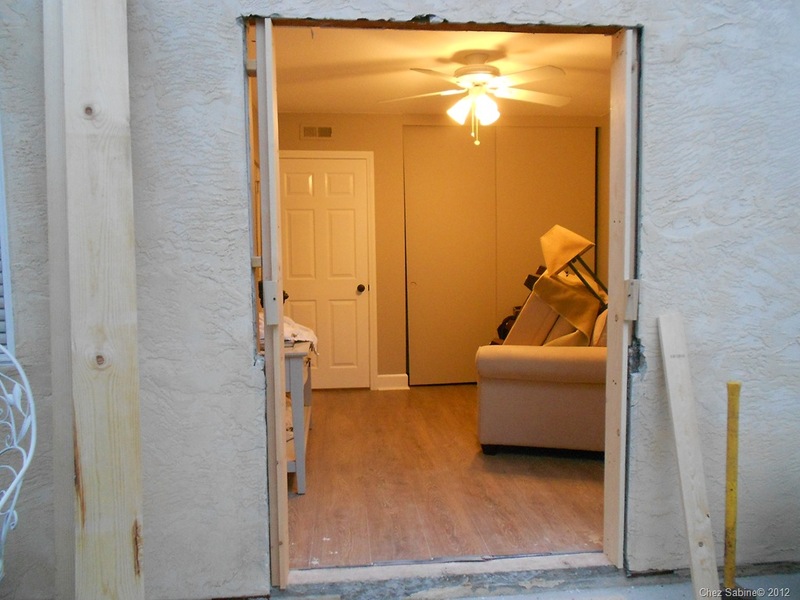 I know you said doors $200, but otherwise, about how much in time and materials would you say this cost you? Because it was a DIY project, I didn’t have any labor charges, so with indoor and outdoor trim and paint, it was under $100. And those doors are really indoor French doors, but because of the mild weather and overhang, they work perfectly fine here. Also, I was lucky that I didn’t have to replace any base molding since it didn’t get ruined when the wall was cut to make way for the doors. That saved on cost. Good luck! Wow, that’s some amazing work. Kudos to you and your ingenuity! P.S. Give those pups a treat for me.